How Much Air Should Go Into an Exercise Ball? 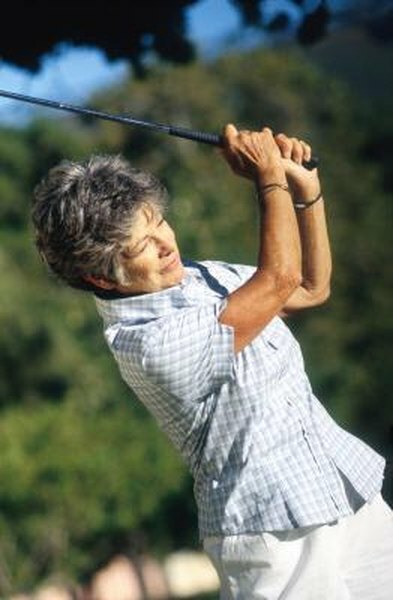 Hybrid golf clubs are effective for seniors because they replace long irons -- typically the hardest clubs to hit well. The best hybrid clubs for seniors are those that can provide increased distance, forgiveness and higher ball flights. Even professional golfers with superior strength have replaced 2 and 3 irons with hybrid clubs because they are able to hit shots that fly high and land soft on the green . The best hybrid clubs for seniors are those that have a low center of gravity, says Golf Digest. The design of a hybrid club head allows the manufacturer to pull the center of gravity down and toward the back of the club head. In traditional long irons, this center of gravity rests higher and towards the club face. With a low center of gravity, you will hit shots with more weight behind and under the ball, which creates a high ball flight and adds distance. This component of a hybrid club is important for seniors who typically have slower swing speeds than younger players, leading to shorter, low-flying shots. Perimeter weighting allows the golf club manufacturer to drive more weight of the club toward the perimeter of the club face, increasing the sweet spot. Senior golfers may find that making consistent contact in the sweet spot of the club becomes more challenging as they lose flexibility and strength. Situations in which the golfer has an awkward stance, such as when the ball is below your feet, can often cause impact toward the toe or heel of the club. If a senior purchases a hybrid club with perimeter weighting, she will be able to hit the sweet spot more and hit crisper, stronger shots. Shaft flexes range from extra stiff, for players with extremely fast swing speeds, down to senior, for players with slow swing speeds. Just because you are a senior citizen however, does not necessarily mean you need a senior flex. Flex ratings depend solely on the speed at which you can swing your club. If you swing your driver at a speed of more than 80 mph, you should opt for a regular shaft. The best way to find out which shaft flex is best for you is to visit a club fitting establishment and have your swing speed measured. Senior flex shafts can benefit certain players. Because the shaft has more flexibility, players with slower swing speeds will be able to create a whipping motion with the club head that will lead to extra distance. While hybrid clubs are easier to hit, especially from the rough or long distances, irons do hold some advantages. Generally, the irons in your bag will provide more consistency of distance and accuracy than a wood or hybrid club. Some seniors will benefit from replacing all of their long irons and even some of their middle irons such as 5, 6 and 7. The best way to measure which irons you should replace is to observe your distances throughout your bag. As you work your way up from short irons to long irons, notice the gap in distance between the irons. Once you are hitting a longer iron less than 10 yards further than the iron before it, you may want to think about switching that iron out for a hybrid. Also, if you have trouble keeping an approach shot on the green, this might stem from a low, line-drive ball flight. If you have trouble keeping a middle or low iron from running off the green, this may be a good iron to switch for a hybrid.